The “Extreme Weather” meme has earned its place in climate change history as the fundamental driver of climate scaremongering, used deceptively and effectively to promote the catastrophic man-made climate change theory by instilling fear, doom and gloom directly into the human psyche through simple imagery and repetitive correlation rhetoric. 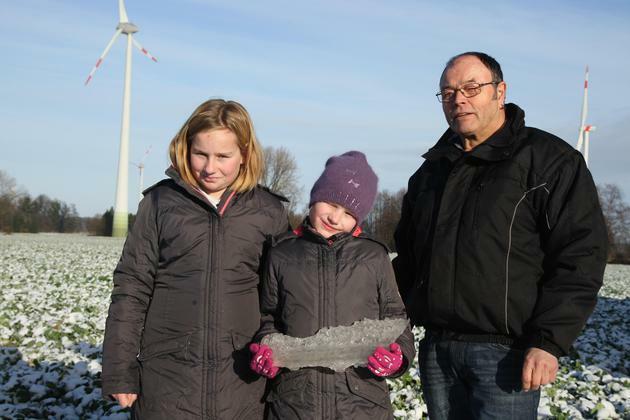 Even though “weather” is not climate, the daily bombardment via news and multi-media of climatic disaster clips provide more than enough evidence for the casual observer to convince them that the climate is in fact changing as a direct result of human CO2 emissions. Much of the mainstream media gleefully encourages and promotes the catastrophic man-made warming narrative. Hence, sensationalising a typhoon in the Phillipines or a forest fire in California has become fair-game in the virtuous and IMHO nefarious push to enhance the supposed human CO2-induced climate catastrophe. However, when you look at hard data and scientific evidence pertaining to extreme weather through the lens of “Government data” and “Peer-Reviewed Science”, as opposed to scary pictures and videos, absorbed via billions of iPhones and hysterical climate-obsessed mainstream media, things are not quite as bad as they seem. In fact, by most metrics, extreme weather events are becoming ‘less’ extreme as CO2 increases. 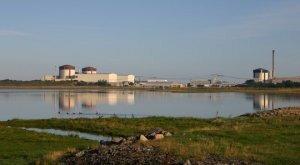 This should come as relieving news to all, though sadly, yet predictably, such data will come as extremely inconvenient news to the virtuous “Save The Planet” lobby and especially those invested in the trillion dollar global warming climate change industry that feeds and thrives off doomsday scenarios. 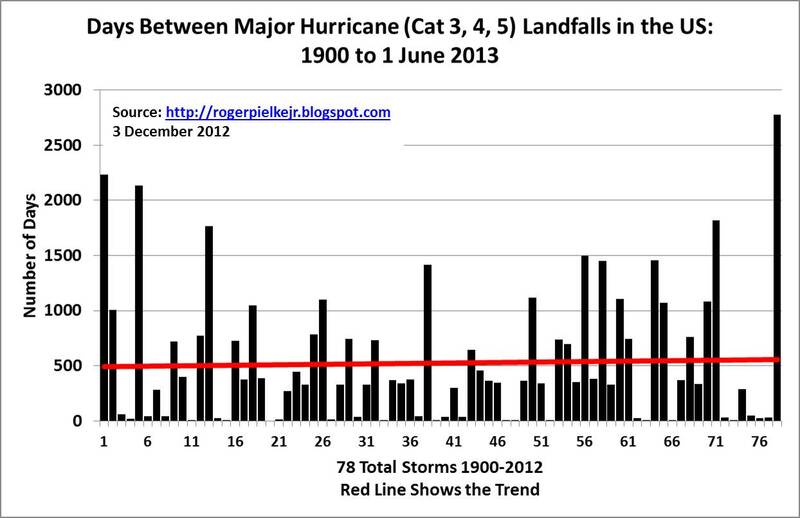 NOAA keeps hurricane records back to 1850. The average number of US hurricane strikes per presidency is about eleven. Obama’s presidency had five hurricane strikes, the last being “Matthew” (Cat 1 at landfall, October 8,2016). No trend in EF-1+ Tornadoes 1954-2014 tornadoes. Large reduction in frequency of stronger tornadoes over the past 55 years. 2016 perhaps a record for the least number of Tornadoes on record. The ACE index is used to compare tropical cyclone activity worldwide among seven decades from 1945 to 2014. Some increase in tropical cyclone activity is found relative to the earliest decades. No trend is found after the decade 1965-1974. A comparison of the six cyclone basins in the study shows that the Western Pacific Basin is the most active basin and the North Indian Basin the least. The advantages of using a general linear model for trend analysis are described. Again, despite rising CO2, there is no trend in tropical cyclone activity after the decade 1965-1974. With a sharp decline in activity over the past two decades. Again, it’s clear from the BoM graph that as CO2 has increased, the frequency and strength of cyclones has decreased. NB, the (warmist) BoM is still yet to update its cyclone graph from 2011. Are they simply lazy? Have no data since 2011? Or are they trying to hide inconvenient climate data that doesn’t fit the CO2-induced extreme weather narrative? You decide. Climate change alarmists (experts) use tangible and emotional climatic horror scenarios to scare you into belief. One of the more classic instances of such fear-mongering, gone horribly wrong, was that by Dr David Viner – esteemed climatologist from the UK’s CRU, in 2000. The original link now boots back to their homepage. January snow extent update… 10th highest on record. Australia’s snowfields have been overdosed by snow over the past 5+ years. ”It’s reasonable to say that a lot of the current drought of the last 12 to 13 years is due to ongoing global warming,” said the bureau’s Bertrand Timbal. Winter was Australia’s second wettest on record – just missing out on a new high by a couple of millimetres, leaving many regions already sodden. “It’s about as wet as it has been in the past 110 years [of records] across Australia,” David Jones, head of climate predictions at the Bureau of Meteorology, said. Floods! Near-record rainfall! When will the head of climate predictions at the Bureau of Meteorology (David Jones) explain why his 2008 prediction of a “new climate” of drought turned out so, so wrong? Mind you, big cities did need more water security as they grew. Dams were the cheap option, but who made those almost illegal? Australia is now awash with water. Nearly every dam is full. And we are left with x4 mothballed desal plants that cost $12Billion to build and are costing the taxpayer $1million per day (each) under contract until 2030/50. Unfortunately, the worst Flannery and his climate change alarmist comrades can ever be accused of, for the litany of failed alarmist dud-predictions resulting in massive taxpayer-dollar waste, is an excess of “Save the planet”virtue. One of the myriad incorrect assertions by climate-change deniers is that scientists who have proven manmade causes for the current global warming ignore periods of warming in the Earth’s past that were not caused by industrial pollution. Since it’s essentially, and of course ironically, entirely non-scientists who make this claim, the deniers would do well to read a recent UCLA study that indicates California’s current six-year severe drought could be exacerbated enough by global warming to extend the dry period for centuries. California has now seen more moisture in the last 8 weeks than it typically does in an entire year… San Francisco, Sacramento, Los Angeles, and several other cities have recorded one of their wettest Januarys on record and an incredibly wet 8 weeks overall. And for those who desire to claim the recent California floods are “unprecedented” and “extreme”, the below graph shows that inflow to Oroville so far this year is far from unprecedented, with a much greater total in 1997. If Sea Level Rise were such a threat, ask yourself one simple Q: Why would Barack Hussein Obama (spruiker-in-chief of climate change alarmism) purchase the Hawaii seaside mansion where Magnum PI was filmed? While warning us of ‘rising oceans’ in SOTU, did Obama just buy a beachfront mansion? | Watts Up With That? Maybe its because, outside of his eco-pantheist ideology and Leftist, wealth redistribution agenda, Obama too, knows very well that Islands like Hawaii “Shape-shift” i.e. they grow with Sea Level Rise. In fact, 80% of Island nations around the world are growing, not “Sinking” as climate activists and alarmists will have you believe. The biggest study of China’s extreme weather finds the frequency of hail storms, thunderstorms and high wind events has actually halved since 1960. When will warmist scientists admit the apocalypse they predicted simply isn’t coming? Oh and just as a side, Al Gore’s “Extreme Weather” poster child sufferers – POLAR BEARS – are doing more than fine…as CO2 rises! If we rely on the above scientific hard data and peer-reviewed evidence, it should hopefully become clearer that colourless, odourless, plant food and trace gas CO2 – the gas of life – does not control the climate or the weather. In my opinion if the temperature gradient between the polar regions and tropics were to increase because of polar cooling, expect to see more and genuine extreme weather occurrences. Ergo, has slight global warming since the 1970’s actually decreased the frequency and strength of extreme weather events? The above evidence strongly supports this case. Especially in the case of Northern Hemisphere Hurricanes, Tornadoes and drought. Ironically and to this point, in 1974 climatologists blamed extreme weather on “Global Cooling”. The panic was so real during the “Global Cooling” scare of the 1970’s that UN scientists wanted to melt the Arctic by spreading black soot on it! And today, the UN, all those expert climatologists and their sycophant media gleefully blame any extreme weather event, not on “global cooling” but now “global warming”. Nuff said. Sadly it appears that at least 1000 lives have been lost in Typhoon Yolanda (or Haiyan), that has just hit the Philippines. There appear to have been many unsubstantiated claims about its size, though these now appear to start being replaced by accurate information. Typhoon Haiyan – one of the most powerful storms on record to make landfall …….The storm made landfall shortly before dawn on Friday, bringing gusts that reached 379km/h (235 mph). So at landfall the sustained wind was 235 kmh or 147 mph, with gusts upto 275 kmh or 171 mph. This is 60 mph less than the BBC have quoted. The maximum strength reached by the typhoon appears to have been around landfall, as the reported windspeeds three hours earlier were 225 kmh. Given the geography of the Pacific, most typhoons stay out at sea, or only hit land once they have weakened. 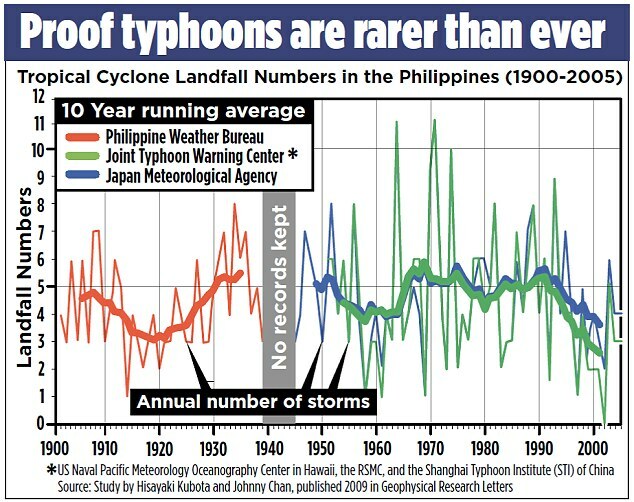 But in total terms, the busiest typhoon season in recent decades was 1964, whilst the following year logged the highest number of super typhoons (which equate to Cat 3 +). Of the eleven super typhoons that year, eight were Category 5’s. So far this year, before Yolanda there have been just three Category 5’s, none of which hit land at that strength. Personally I don’t like to comment on events such as these until long after the dust has settled. Unfortunately though, somebody has to set the record if we cannot rely on the BBC and others to get the basic facts right. In case anyone thinks I am overreacting, take a look at the Daily Mail headlines. Just looking at it again, is it possible the MSM are confusing mph with kmh? It seems a coincidence that PAGASA report 235 kmh. I have just registered a complaint at the Press Complaints Commission against the Mail article. If anyone spots similar articles elsewhere, and I will add them to my complaint. I seem to have been right about the kmh/mph confusion! Unless they think “gusts” are less than “winds”, it looks like someone has boobed. Typhoon Yolanda is claimed to be the strongest storm ever, with gusts of 275 kph. Yet back in 2006, Typhoon Reming recorded 320 kph. And in 1970, Typhoon Sening registered the same 275 kph. All figures are from the Philippine Met Agency, PAGOSA, and are calculated on the same basis, as the windspeeds at landfall. So why are we being lied to? By Cris LaranoWSJ.COM 11/14/13–MANILA—When supertyphoon Haiyan, locally known as Yolanda, made landfall last Friday on Guiuan, a coastal town on the central Philippine island of Samar around 410 miles south of Manila, it was described by some as the strongest storm to make landfall in the world this year, maybe ever. Data from the national weather bureau, the Philippine Atmospheric, Geophysical and Astronomical Services Administration, or PAGASA, showed that Typhoon Haiyan’s intensity – measured by the wind strength at its center and the speed of gusts at landfall – Haiyan ranks at number 7 among the strongest storms ever to have hit the Philippines. 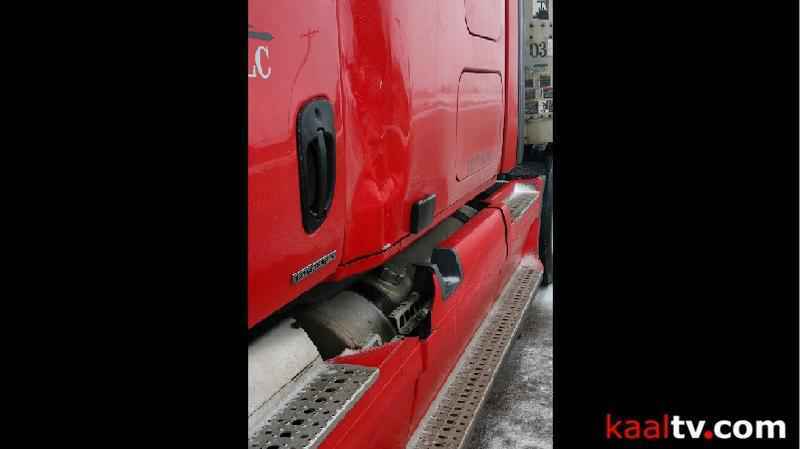 It could eventually prove to be the deadliest, with the death toll currently at more than 2,300 and mounting. 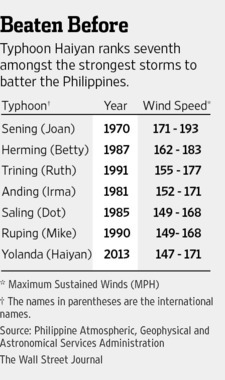 But among the so-called supertyphoons— those with center winds in excess of 134 miles an hour — the title goes to Joan. Known locally as Sening, that storm made landfall in Virac, Catanduanes province, north of the current devastation and around 236 miles south of Manila. When it hit, Joan had center winds of 171 miles per hour and gusts of 193 miles per hour, compared to Haiyan’s 147 mph.